Good work - this one loads up fine but wallet is out of sync and not syncing at all - do I need to add nodes? Wow, that sounds good... more confirmations from others? Change this path if you need. Loving the online wallet Zeit. That is a great idea - props to FaSan and the Zeit team. Clear, professional presentation too, looks good. Couple of questions - what are the small mining fees and is PoS calculated on balances? Didn't see mention of these in the Ts+Cs. The fee is calculated about the TX size, based on 0.1 ZEIT (some the original wallet). The service is free. About PoS I'm not very much sure yet. Theoretically cannot work, because the original wallet don't have the private key of the user's addresses. Personally, I think the give-aways tend to hurt the price. These people have no ownership, no deep investments in mining equipment, electricity, or direct investment funds so they are quick to sell out. Get their handout and instantly put it up for sale. I'm sure it's not the case with everyone, but I would wager a large number of the recipients have this short term outlook. I agree with what you posted about some people getting their handouts and immediately dumping them. It can have a negative impact on the price at first, but a strong coin can and will recover. Let them dump and get out of the community as quickly as possible, because if that's all they are interested in then we don't need them anyway. However, in this case I do not see the giveaway as a bad thing. It was used as a reward to get people involved and to advertise the coin to the world. The devs could have easily taken the premined coins and dumped them for profit for themselves and then let the coin die like so many other altcoin "developers" have been doing. Instead, they generously shared them with those of us willing to put forth a little effort to help promote the coin. That is a sign that the devs have their heart in this coin and are doing what they can to ensure the coin stays legit. And yes, there are a few of us who are willing to deal with a little bit of extra power usage to mine the coins too. My CPU is just chugging away! Maybe one day I will have a little extra funds available to invest in a mining rig that can get me more than a few coins a day. But for now I have responsibilities to my family as well. Let's just keep mining and supporting this coin as best we can! Thumbs up for your post and your support of the community! Show your support for this coin. No. Does not work. Crash. 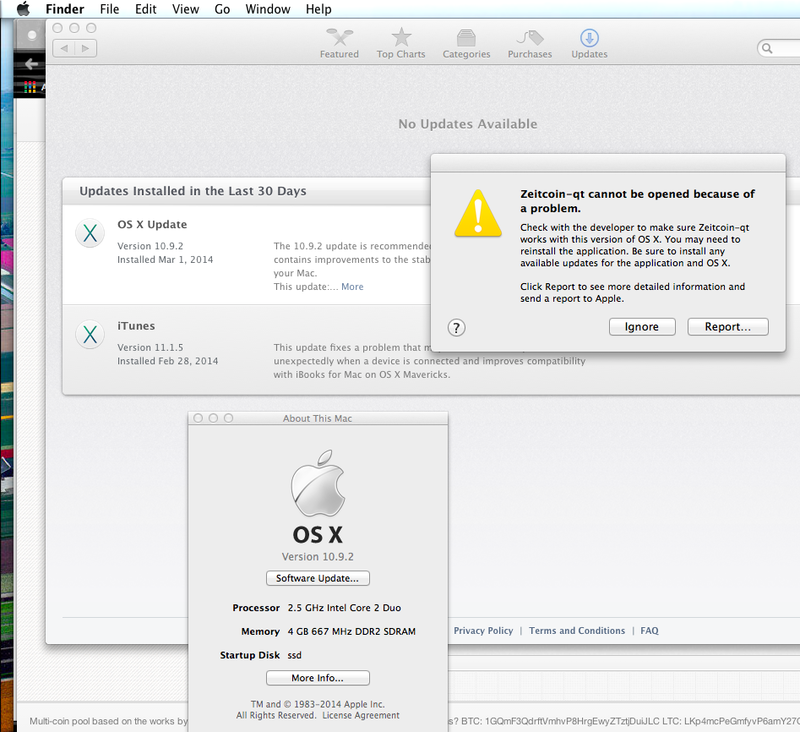 I've checked on a clean Mavericks Installation, now. It works. anyone else having problem with zeit.hash.so? stratum seems working in cgminer but the website won't open in browser. just logged in and checked on my mining op no problems with hash.so? then it should be something from my part, because no matter what, the site won't open for me! but for mining it seems okay in cgminer. i made this fresh install for testing, man. Because it was always running on my system without problems. Did you get the latest version? This looks like another version, by another developer. Only last postet version here is working. LSOpenURLsWithRole() failed with error -10810 for the file /Users/rocou/Desktop/Zeitcoin-qt.app. I created a new session: same error. ZEIT Mac wallet has never worked for me. I am completely updated, if you think many mac users will do a fresh install on a virtual box just to run one wallet maybe you should reconsider. A fully functional mac wallet is crucial for wide spread adoption. Whens this first block half happening? I see some off and on success rates with the newer Mac builds. I cannot test from work, so I'll let you know later. That said, there was a comment to "add nodes" and I'm wondering how that is done. In the wallet itself or do I need to edit some file? Pssssssssst! Now accepting donations from the "super rich" of Zeit. Help me get to my first 6-figure coin... ever! I see we're dealing with another computer user from 1995. Take your MCSE and shove it. I think we should look at original coin (Zeit is a clone obviously) and check out libraries exactly bundled with it.